To become a good photographer you should BE a photographer as much as possible. It’s a pretty simple premise. The more photos you compose, process and analyse the greater you will understand photography and improve upon your skills. So.. it’s simple.. TAKE YOUR CAMERA EVERYWHERE! You never know when a good photo opportunity might appear or a good excuse to just experience photographing a new subject matter. 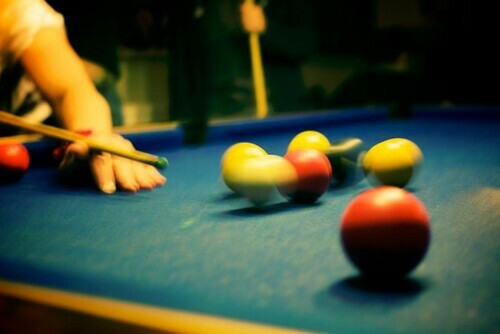 So, living up to my own good advice I took my camera with me to a recent night out with friends, playing Pool (or Billiards depending on where you are in the world). This kind of environment is a great challenge. Not only for you but for your camera! The relatively low light conditions means you’ll be shooting at high ISO ranges, with the aperture wide open to get in as much light as possible. This of course has the side effect of drastically reducing the depth of field. Personally i love the low light conditions and narrow depth of field. It really adds to the nostalgic, smokey (until they banned smoking) night time feel. Most of the photos were shot at around 5000 ISO with the aperture between f1.8 and f3.5. You’ll often find a lot of your images are focussing on the wrong area. Mainly due to it being dark when you’re looking through the view-finder. Autofocus either doesn’t work at all or will focus on the wrong area of your composition, drawing your eye away from the area you wanted your shot to be about! If the focus is in the wrong place you lose that emphasis and the photo (usually) doesn’t work. So keep it on manual focus, you can always take a few shots at different focus settings to ensure one of them works out ok. 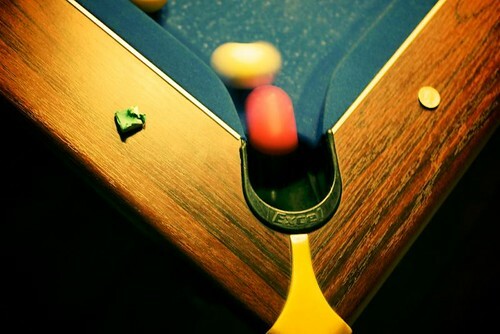 Pool is a great game for capturing some action with motion blur. You’re not likely to have a tripod with you (and you might upset the landlord!) so expect to also capture some of your own motion in the process! Sometimes that doesn’t seem to matter. 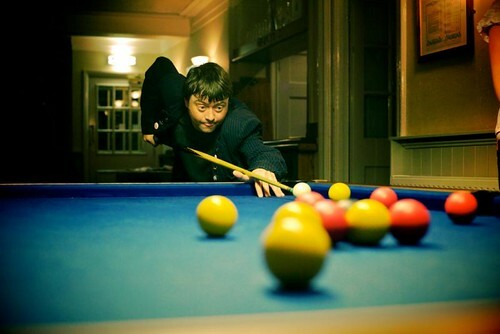 I personally love this shot as the motion of the players hand and cue along with the movement of the pool balls and myself seem to make the photo work quite well. 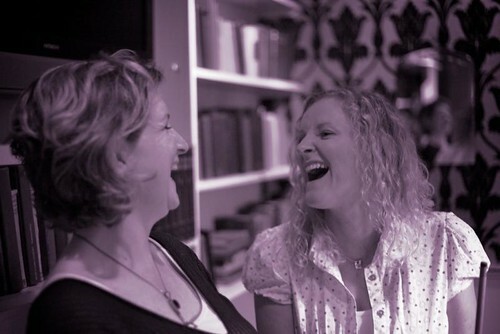 One of the great things about taking your camera with you on a night out is that your friends know you. They feel relaxed around you and are more likely to smile when you point a camera at them rather than feel awkward and shy away. This really helps, without my friends it may have been a lot tougher to get such natural looking shots and some of them worked out really well like this one. Your photos don’t always have to be in colour either. Sometimes they work so much better in black and white, or in this case black and white with a slight purple tint. If you’re shooting in low light conditions with high ISOs you’re likely to end up with noise in your image, something that may annoy you in a colour photo but can really add to a black and white shot. Give it a try. You may just fall in love with a shot you would have otherwise deleted. Shoot lots and shoot often. Take your camera everywhere, try and capture “photos” rather than “snapshots”. Oh and be sure to give a copy to your friends! After all they just gave you another reason to shoot! There are more photos from my pool night here. As ever your thoughts and comments are welcome. Share your experiences, your advice, or let me know if you think there are ways to improve upon some of the shots I’ve taken.